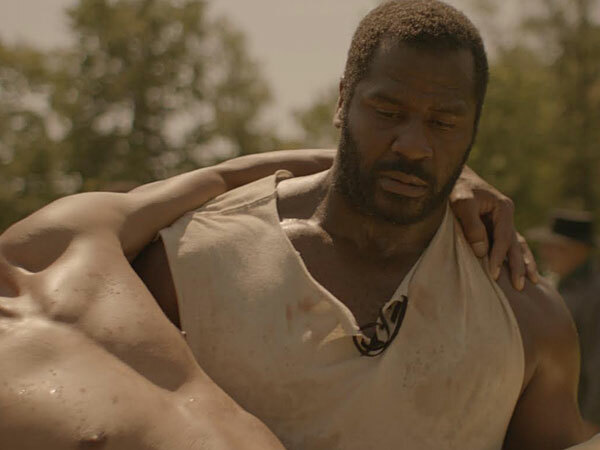 “The North Star”: Jeremiah Trotter stars as Benjamin ‘Big Ben’ Jones, carrying John Wooten, playing Lewis Stone. One of my tablemates, at the Princeton chamber breakfast featuring Jacque Howard on Wednesday, was Robert Church of the Doughmain Education Fund based in Research Park. He told about a golf tournament on October 19 to raise funds for innovative financial literacy tools for students. He was also excited about a historical film re the slave trade and the Underground Railroad. Church went to the Kimmel Center premiere of the new North Star film (the old one, made in 1943, was about the Nazi invasion) starring former Philadelphia Eagle Jeremiah Trotter as Benjamin “Big Ben” Jones. From my point of view, The North Star was a remarkable re-telling of a truly American story that demonstrated what is great about the American spirit. I found the cinematography was very different from anything that I have ever seen in a film on this particular subject matter. It put the characters front and center with the viewer, making for a very personal experience. Also, Jeremiah Trotter, the former Eagle linebacker had a leading role and gave a warm and impressive performance. I had all to do to keep myself from giving him a big hug when I saw him following the film. The North Star will be screened in Newtown, Pennsylvania with tickets available now through September 24th. In this true story, Big Ben and Moses Hopkins, according to the plot summary, were slaves who escaped from a Virginia plantation and made their way to freedom in Buckingham (Bucks County) Pennsylvania in 1849. They experienced heroism, romance, and treachery. “Big Ben’s 6 foot 10 inch size and a record bounty for his safe return make him the focus of every slave hunter on the east coast. Their journey exposes them to danger and cruelty; however it also exposes them to the unexpected kindness of the people involved in the Underground Railroad. These experiences will change Ben and Moses forever. Upon reaching the relative safety of Mt. Gilead Church on Buckingham Mountain, Ben and Moses get to experience life as free men and cross paths with historical figures such as Frederick Douglass, Harriet Tubman, and Joshua Fell.” Big Ben worked for Fell in Mechanicsville, PA. When, how, can we see this film in New Jersey?